You are here: Home » Blog » Cost of Living » Cost of Living: How Much of Your Budget Goes to Food? Cost of Living: How Much of Your Budget Goes to Food? Knowing what percentage of our cost of living is spent on food is always a good thing to know. We recently published an article by Lynn Carpenter on her Cost of Living- Real Basket of Goods in it she compares the cost of several ordinary food items over the decades. Her weekend meal basket included “one loaf of bread, one pound of coffee, one dozen eggs, three pounds of mid-price beef, one box of Corn Flakes or Cheerios, five pounds of potatoes and one Hershey bar.” In this article she determined that over the years a minimum wage earner would have to work 9.25 hours in 1938 to buy this food. But by 1961 a minimum wage earner only had to work 3.75 hours to buy the same food. Since then the number of hours needed stayed about the same during the 1970’s but spiked to 5.5 hours in 1981 and subsequently dropped back to about 4 hours. I just calculated Lynn’s cost of living list based on the current minimum wage of $7.25 per hour and found that based on the foods in my local stores it would cost between 3.25 and 3.5 hours of work at minimum wage to buy her list. I say a range because my local store was having a buy one get one free sale on the 5 lb bags of potatoes. That puts current food prices below the low price Lynn found in 1961. But I’m sure the prices in different parts of the country vary drastically. I’m sure it will be much higher if you live in California. (By the way the minimum wage in California is $8.00) Here in Central Virginia this is the result. If you would like to post your local results in the comments below please do so. You can verify your state’s Minimum Wage here. Interestingly, the Bureau of Labor Statistics came out with a comparison of prices between countries for food, housing, transportation, health care and clothing. And rather than compare prices they have done something similar to what Lynn did and they are comparing them as a percentage of income. The study is surprisingly outdated (2009) considering it was just released by the Bureau of Labor Statistics in March of 2012. But the data shows that of the four countries studied, The U.S. spends the lowest percentage of its income on food. 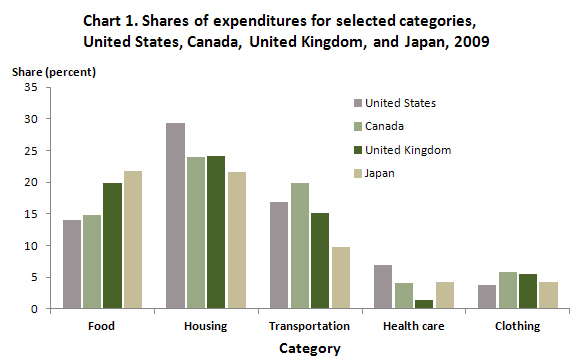 U.S. citizens spend 14% of their income on food (8.3% at home and 5.8% at restaurants) while at the other end of the spectrum Japan spends 21.8% of their income on food and Canada only spends slightly more than the U.S. at 14.8% while the U.K. spends 19.9%. Housing on the other hand is reversed with the U.S. spending the most on housing at 29.3% while Canada, the U.K. and Japan spent 24%, 24.1% and 21.6% respectively. So it appears that we Americans spend our food savings on bigger houses. The survey doesn’t take the size of the house into consideration. The U.S. also spends more on Health Care at 6.9% of income while Canada spends 4.1%, U.K. spends 1.4% and Japan spends 4.3%. Of course this doesn’t take into consideration the percentage of your budget that goes into taxes to support socialized medicine. When it comes to clothing once again the U.S. had the lowest percent of household budget going toward this item. We also spent the least on culture, entertainment and recreation. Not sure whether this means we are the least cultured or simply that our entertainment costs less. (1) Including miscellaneous expenditure shares and categories that are unique to a particular country. Because these categories were different for each country, they were not used in direct comparisons in this article. Can We Trust Government Inflation Numbers? Where I live in AR., the cost of your “weekend food basket” would take 4.8 hrs of minimum wage at $7.25 hr. now. I remember when a Hershey bar was a nickle, milk was $.90 and eggs were $.19 dozen in the mid to late 1960’s in Chicago. In 1972 gas in Chicago was $.69 gallon on Western and Winnona and at the same time it was $.39 gal in Leslie, AR. In Chimes AR (out in the boonies) gas was $.25 gal. I’m a Sr. on SS and can tell you according to what my benefits are, I spend about 20% of my income on food and 6-10% on necessities, like toiletries, cleaning supplies, etc. and about 20% on co-pays for prescriptions and 45% goes four housing and utilities every month. Doesn’t leave anything for entertainment, eating out, etc. I didn’t add a hershey bar, it would have been $1.00. The bread I buy is whole grain, natures own. I’m diabetic so have to watch what I eat. Was so glad to see eggs in the stores again and at a much lower price than they were for a few years after that bird flu wiped out so many of the laying hens. Here, egg prices rose to $3-4.00 dozen. I bought them when I could, but did eat more cereal during that spell! I like my eggs! Now at in Taxes ( Local and Federal ) paid over the decade.